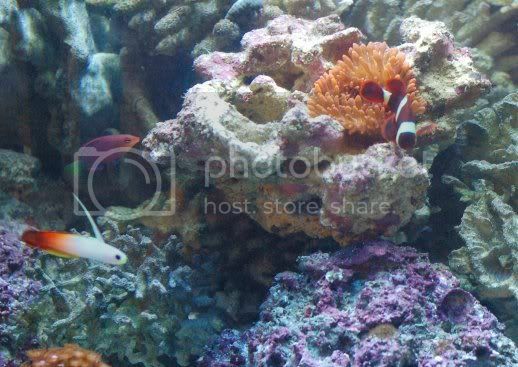 I'm looking at buying this saltwater setup. It's 75 gallons and it has, what I believe to be a 30-35 gallon sump. It comes with everything except live rock and a water pump. I have no idea what kind of pump to get and how much gph it needs. The owner says it has a 3/4" intake or something. I think there is 3 holes, 1 for return and 2 for intake. The tank is quite the step up from my 12 gallon nanocube and I'd really like to get more information on it before I go and purchase it. Sorry it has 2 returns and 1 overflow. Acrylic sump, with float switch and vacuum relay backup. I really have no idea what this means, so please if you can help me. Feel free to give advice. i think the MD9.5 would be your best bet. you wouldnt have to reduce the piping at all, and it will push 800 GPH at a 3 foot head, assuming the sump is in stand. the float switch is either for an automatic top off, OR it is so that if the sump starts to get too full it will shut off the return pump. and the vacuum relay backup could be to break the siphon that killing the pump would create, further protecting you from putting 110 gallons of water into your 35 gallon sump. i dont know how much it is for the set up, but with the $100 pump i set the link for, you should be in business. or find one used, or possibly some previously loved Live Rock, i see it for $1 per pound on creigslist every so often. HAPPY REEFING! Also, to save money consider buying base rock and just seeding it with a little LR. I was dealing with the same question.... I baught a used 90 that came with a MD12 which pumps 1100-1200 gph at 3ft. Is this too much..... I dont want to over power the tank. I also dont want to buy to big of a pump if I have to replace the one that came with my purchase. I was told that maybe I should have the MD9.5. Float switch and vac delay back up? Please explain? I have been running a 20 and 30 gallon tank on biowheels so my wet/dry is all new to me and I want to protect myself from flooding my house. answered in reply number 3. Not sure why a vacuum relay would be necessary. Seems complicated. Sounds like he has a built-in overflow, not a siphon (hang on) overflow, correct? Just run your normal sump water level lower to allow for the extra 5-7+ gallons of water that flows back to the sump when the pump is off. No check valves or relays needed. I am a proponent of having the minimum amount of flow through the sump (3-5x display volume). This does two main things: helps prevent micro-bubbles from returning to the display, and your water level in the display will be slightly lower due to the slower pump, minimizing the amount of backflow to the sump when the pumps are off. More flow can work if you have really good baffles in the sump. Your choice. I prefer Eheims for submerged return pumps, because that's all I've known and they have always been rock-solid reliable for me. The prestrainer on the pump works great, I just ditch the sponge inside. A Eheim 1260 will give you 400gph at a height of 4'. Almost 5x. They cost a bit more, but peace of mind is worth something. If you decide on another pump, I would not recommend anything above 8-10x. For faster flow, the Mag Drive is a good choice, as is an Eheim 1262. I guess maybe I worded the question wrong. How would I add this emergency feature to my wet/dry? I will look it up online but if you have any insight that would be cool. So I have been trying to figure out exactly this float switch I guess hooks up with your pump to avoid overflow. I think that float switch is like you use to turn pumps on and off for an ATO. So when the water in your sump gets below a certain level the little pump that draws water from the fresh water tank turns on and when the water in the sump gets back to "full" it shuts the water pump off. I guess you could somehow hook it up to the return pump but it really isn't necessary. I've had a couple of floods but none of them have been due to the sump overflowing. If your tank uses a siphon type over flow box you can use an aqualifter pump to restart the siphon in the event of a power failure. what size pump for 57 watt uv? phosban reactor 150 pump size? What size Mag pump for draining? What size return pump for maximum flow?